What happens when your owner decides to cast you away and abandons you on the side of a road? Well, you must fend for yourself and your very survival is at stake! Until you meet the neighborhood cat, who decides to help you out. Do you have the survival skills needed to overcome this challenge? 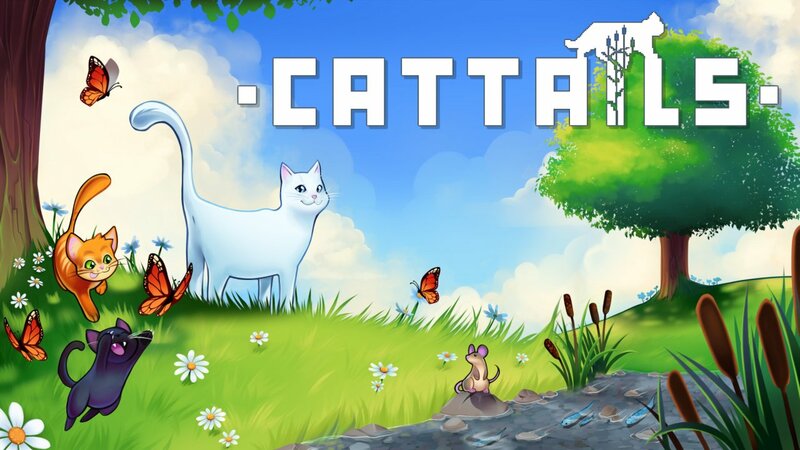 Cattails, a game from Falcon Development, isn’t the first of its kind to hit the Nintendo Switch, it is however the first Falcon Development game to release on Switch, but enough about that, it’s time to talk about the game. Cattails begins with an open road the side of a road where you’ve just been abandoned by your owner. A mysterious cat ends up finding you and begins to introduce you to your new lifestyle of hunting, exploring, & fighting. You’re first shown how to sneak and pounce on your pray in order to have your first meal, can you sneak up on that pesky mouse? Once you’ve successfully done so, your next task is to join the local forest guild where you are then given a proper home alongside a close group of allies. You get acquainted with the townsfolk and then get started on your first day of your new lifestyle. Let’s dive into the various mechanics within Cattails shall we! Fans of titles like Stardew Valley, will find many similar mechanics at work in Cattails. Firstly you have the calendar/day cycle which consists of a normal 24 hour day (although sped up like Stardew Valley) with a day/night cycle. A “Calendar” year consists of Ten days and are broken up by the four different seasons. On the last day of every season, a special festival will happen. Festivals are special days where the three cat guilds all unite for a day of peace at the Sacred Temple. These festivals will often offer a special mini-game that’ll allow you to earn an exclusive currency that can then be redeemed for special items such as clothing or a pet. The second mechanic is skill upgrades. There are four different skills for your cat to upgrade and advance to help up your survival instincts! Hunting, fighting, swimming, and foraging are all tasks you’ll need to do in order to survive. There’s also XP that can be earned via killing enemies, hunting prey, foraging for food, and more to achieve stronger abilities. The third mechanic is guilds/factions. In the world of Cattails the land around you is controlled by three various guilds the forest, mystic, and Mountain. Your goal is to fight off the opposing groups as they try to claim your territory. Each day, a new battle will break out and is your task to battle off the impending foes as they invade your land. The map will indicate where you’ll need to go each day. The final mechanic, being quests/achievements that are given to you upon reaching the Sacred Temple. Once you’ve progressed, you are tasked with unlocking these mysterious statues that will require certain items to awaken them. Just get out there and hunt and then bring the bait back to the statue! All these various mechanics definitely help Cattails stand out amongst the many Nintendo Switch games currently available. When I first saw this game, I could immediately compare it to games like Stardew Valley and it definitely made me excited to get my hands on it for this review. Who knew living the lifestyle of a cat could be so interesting yet so fun and addicting! Part of Cattails charm comes from the background elements such as the music and visuals in my mind. The music is calming and generally enjoyable to listen too as you explore the world around you! Although the soundtrack doesn’t offer much in terms of variety, I still thoroughly enjoyed my adventure through the land of Cattails. The visuals and art style where definitely a high point for me as it looked fairly unique compared to the other games I have played. With this being the first console port for Cattails, Falcon Develops really delivered in an overall enjoyable experience. Have they truly captured the essence of Stardew Valley within Cattail? In my mind, they certainly did! The various mechanics at hand definitely left me hooked on Cattails and it’ll definitely leave you excited to play more. A large amount of content is at hand in Cattails, and if you’d like to live the life of an abandoned cat, then this game is the way to go on Nintendo Switch.